Ford Transit MK5 electrical system, these are car parts like airbag control module and ESP module. Ford Transit MK5 electrical system, these are car parts like airbag control module and ESP module. 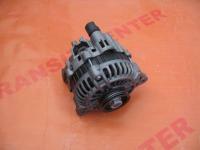 In this department you may also buy for instance, the alternator, the car horn, the heater switch or the spark plugs. The fifth generation of this famous van, which made records in most markets around the world, is a great modernization of predecessor. There was changed a.o. the interior: a new dashboard, a center console and the accessories. Apart from that there was shown the new engines and stylistic changes in front part. It is worth to note the additional equipment, such as the ABS, the air conditioning, the electric windows and mirrors, etc. However, if this everything work properly, the functional electrical system is very necessary. We own in our internet offer such the components as the alternator, eg. for Ford Transit model from 1997 with 2.5d engine, as well the airbag control module or the ignition switch. We should keep in mind, that the good condition of electrical system and ignition guarantees the reliability of the vehicle, and in the case of this type of car that earns for itself is particularly important. Of course, if searching product is missing please contact with us to make an individual order.